Fresh apricots, simmered with apricot brandy and toasted pecans, are an indulgent but quick-to-prepare treat served with hot toasted waffles. Heat a non-stick frying pan. Place the apricot quarters in the pan and gently cook for 3 minutes, turning frequently until the fruit begins to brown. Meanwhile, heat the waffles according to pack instructions. Add the pecan halves to the fruit and toast for a couple of seconds. Add the maple syrup, apricot brandy and the lemon juice, then bring to the boil and simmer for 1 minute. 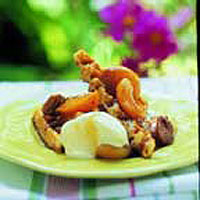 Serve the fruit spooned over the hot waffles and top with a generous scoop of Waitrose Vanilla Ice Cream. Use ready-made Scotch pancakes instead of waffles.